This article is about the Eastern Pennsylvania region. For other uses, see Lehigh Valley (disambiguation). The region is a part of the larger New York City metropolitan area, but borders the Philadelphia metropolitan area. All of the region, except Warren County, New Jersey, is part of Philadelphia's designated media market. The Lehigh Valley is the third most populous Metropolitan Statistical Area in the state of Pennsylvania with a population of 821,173 residents as of the 2010 U.S. Census. The region is eclipsed in total population in Pennsylvania only by the metropolitan areas of Philadelphia and Pittsburgh metropolitan areas. It is the 64th most populated metropolitan area in the United States. Lehigh County, the Valley's largest county in terms of overall population, is among the fastest growing in the state and, as of 2010–2012, ranks in the 79th percentile for population growth nationally. The core population centers are located in southern and central Lehigh and Northampton counties along U.S. Route 22 and Interstate 78. The Lehigh Valley is proximate to two of the nation's largest cities: New York City, which is about 75 miles to its east, and Philadelphia, which is 50 miles to its southeast. The Lehigh Valley is named for the Lehigh River, which runs through it, and owes much of its development and history to the anthracite supplies, timber, and ores which poured down the Lehigh Coal & Navigation Company's (LC&N) Lehigh Canal and railroads LC&N built or encouraged parallel to it. The lower Lehigh Valley is geologically part of the Great Appalachian Valley and is bordered on the north by the mineral-rich Ridge and Valley Appalachians, which define its rugged upper parts from White Haven and west of the Poconos, south through the Lehigh Gorge to the Lehigh Gap near Palmerton. The upper drainage basin contains or shares [a] nearly half the southeastern Coal Region, which have the richest anthracite deposits in the world, while the lower valley holds valuable limestone, sandstone, and clay deposits. In the charter of March 20, 1818 for the Lehigh Navigation Company, the legislature gave virtual total control to the Canal Company [b] which it retained until 1964. These transportation improvements overcame the country's first energy crises due to deforestation in the early 19th century. The Canal operated into the Great Depression, feeding ports up and down the Delaware River, the Delaware Canal, and transoceanic demand, and was integral to the regional industrial revolution in the greater Philadelphia- Trenton- Wilmington region. The Morris Canal and the 22–23 miles (35–37 km) coal feeder of the Delaware and Raritan Canal and locks at New Hope on the Delaware Canal were built to fuel the anthracite needs of Newark, Trenton, Jersey City and New York City. Consequently, culturally and historically, the Valley runs from the drainage divide in the Solomon Gap just north of Mountain Top where coal flowed up the Ashley Planes from the Wyoming Valley coal beds in Luzerne County and across the divide, then downhill to the White Haven, then down through the Lehigh Gorge, past the historic Jim Thorpe terminus of the Summit Hill & Mauch Chunk Railroad (SH&MC) [c] through historic locks and dams below Jim Thorpe or alongside the canal which fueled the American Industrial Revolution and operated into the Great Depression. The American Canal age had its epicenter at the confluence of the Lehigh and Delaware rivers where five major canals  met major rivers and coastal waterways, and all gave the people and industries of the Lehigh Valley access to minerals and markets via Easton from Connecticut, New York, Delaware, New Jersey, and Pennsylvania. The United States Office of Management and Budget has designated the Lehigh Valley area of Pennsylvania as the Allentown–Bethlehem–Easton, PA Metropolitan Statistical Area. The three counties in the Metropolitan area are Carbon, Lehigh and Northampton. As of the 2010 United States Census the Metro area had a population of 821,173. The Lehigh Valley ranks as the third most populous metropolitan areas in the state of Pennsylvania and ranks 68th most populous in the United States. The United States Office of Management and Budget also has designated the Lehigh Valley area of Pennsylvania as part of the larger New York metropolitan area. The larger combined area consists of the Lehigh Valley counties of Carbon, Lehigh and Northampton as well as Pike County and the Monroe County/East Stroudsburg, PA Metropolitan Statistical Areas in Pennsylvania, and several other Metro areas from the States of New Jersey and New York. As of the 2010 US Census, the population of the CSA was 23,076,664, making it the most populous Combined Statistical Area in the United States. At the 2008 American Community Survey conducted by the U.S. Census Bureau, the Lehigh Valley had a population of 808,210. 87.1% of the population were White American, 4.6% were Black or African American, 0.1% were American Indian, 2.3% were Asian American, Native Hawaiian and Pacific Islander Americans made up 0.1%, 4.3% were of some other race, and 1.5% belonged to two or more races. Hispanics and Latinos of any race made up 11.3% of the population. The Lehigh Valley is known historically for its production of steel, Portland cement and apparel. It had served as a major U.S. center of industrial manufacturing since the 1800s but this role had diminished significantly in the late 20th century and early 21st century as companies moved to offshore locations for these activities. Large national and international companies either based in the Lehigh Valley or with major operations here include LSI Corporation (in Allentown), Avantor Performance Materials (Center Valley), Air Products & Chemicals (in Trexlertown), Crayola LLC (in Easton), Buckeye Partners (in Emmaus), Heidelberg Cement (in Fogelsville), Just Born (in Bethlehem), Lutron Electronics (in Coopersburg), Mack Trucks (in Allentown), Olympus Corporation USA (in Center Valley), OraSure Technologies (in Behlehem), PPL Corporation (in Allentown), Rodale Press (in Emmaus), Sands Casino Resort Bethlehem, Dun & Bradstreet (in Center Valley), Synchronoss Technologies (Bethlehem), Victaulic (in Easton), and many others. The Norfolk Southern Railway (owned by the Norfolk Southern Corporation), is the Lehigh Valley's major rail operator. Norfolk Southern Railway uses the former Lehigh Valley Railroad's main line, the Lehigh Line and also uses a former Reading Company (Reading Railroad) branch line, the Reading Line. Norfolk Southern Railway has major classification rail yards in Allentown and Bethlehem. The Lehigh Valley is also one of the largest areas on the East Coast for the location of warehouses and distribution centers. Because of this, it is sometimes referred to as the nation's "second Inland Empire" for freight. Companies that own and operate warehouses and distribution centers in the Lehigh Valley include Amazon.com, B. Braun, Boston Beer Company (brewer of Samuel Adams brand beer), BMW, Bridgestone, FedEx SmartPost, Home Depot, J. C. Penney, Nestlé Purina, ShopRite, Stitch Fix, The Coca-Cola Company, True Value, Uline, Zulily, and many others. Most of these distribution centers are located along the U.S. Route 22, Interstate 78 and Interstate 476 corridors. The Lehigh Valley is home to many retail establishments. The largest retail area of the Lehigh Valley is the Pennsylvania Route 145/MacArthur Road Corridor, just north of Allentown. It is anchored by the Lehigh Valley Mall and the Whitehall Mall. Yocco's Hot Dogs, the regionally-famous fast food establishment known for their hot dogs and cheesesteaks, maintains six locations, all of which are based in the Lehigh Valley. Its original restaurant, founded in 1922, is still located at its original center city Allentown location, on West Liberty Street. Five additional Yocco's locations can be found in the Lehigh Valley (in west-side Allentown, east-side Allentown, Emmaus, Fogelsville, and Wescosville). The Lehigh Valley is part of the Philadelphia television market, and also receives television stations from New York City and Scranton/ Wilkes Barre. Lehigh Valley-based stations include WBPH-TV, an affiliate of FamilyNet, a Christian network licensed to Bethlehem, with studios in Allentown; WFMZ-TV, an independent commercial television station atop South Mountain in Allentown; and WLVT-TV, a PBS station licensed to Allentown with studios in Bethlehem. The Lehigh Valley is home to over 35 radio stations, spanning multiple formats, including tropical (spanish radio) news, talk, and sports, CHR/pop music, country music, National Public Radio, sports radio, oldies, polka, hot adult contemporary, soft rock, classic rock, hard rock, and a variety of college radio stations. Lehigh Valley-based daily newspapers include the Allentown The Morning Call and the Easton The Express-Times, both with rich traditions dating back to the mid-1800s. The Lehigh Valley also features Lehigh Valley and Pocono Sports Extra (a monthly all sports publication), Lehigh Valley Style (a regional lifestyle publication), Lehigh Valley Magazine (the region's oldest lifestyle publication), Lehigh Valley Exposed (an alternative news and entertainment weekly), and four Spanish language newspapers, Al Dia, El Hispano, El Torero, and La Cronica. Lehigh Valley community publications include The Blue Mountain Town & Country Gazette in the northern part of the Valley. As the third most populous metropolitan region in Pennsylvania, the Lehigh Valley is served by numerous school districts, public and private high schools, middle schools, and elementary schools. From 1996 until 2012, the Lehigh Valley was the home of pre-season training camp for the NFL's Philadelphia Eagles, which was held each summer on the practice fields of Lehigh University in Bethlehem. The Lehigh Valley Storm, a semi-professional football team, is based in Bethlehem. The Lehigh Valley also is home to the Lehigh Valley Steelhawks, a National Arena League team, which began playing their home games at Stabler Arena in Bethlehem in 2011. In early 2008, Coca-Cola Park, an 8,100-seat Minor League baseball stadium, opened in east-side Allentown. The stadium hosts the Lehigh Valley IronPigs, the Philadelphia Phillies' AAA-level International League franchise. The team previously played as the Ottawa Lynx (1993–2007). The club's move to the Lehigh Valley brought the franchise closer to Philadelphia and the Phillies' large eastern Pennsylvania fan base. The team's name is a reference to pig iron, a key ingredient in the steel-making process for which the Lehigh Valley area is known worldwide. Groundbreaking ceremonies for Coca-Cola Park were held September 6, 2006, and construction was completed in December 2007. The stadium hosted its first game on March 30, 2008, when the Phillies major league team faced the IronPigs. Multiple East Penn Conference athletes have gone of to professional careers in Major League Baseball, the National Basketball Association, and the National Football League. An additional 14 Lehigh Valley high schools too small to compete in the East Penn Conference compete in the Colonial League. Lehigh Valley Rollergirls (LVRG) is a women's flat track roller derby league based in the Lehigh Valley. Founded in January 2006, Lehigh Valley Rollergirls was the first skater-operated flat track roller derby league in the Lehigh Valley. LVRG is a member of the Women's Flat Track Derby Association and competes against national and international teams. It hosts its home matches at Hamburg Field House in Hamburg. The Lehigh Valley hosts the Lehigh Valley 15K Road Race annually in September. Runner's World magazine, which is based out of Emmaus, has held the Runner's World Half Marathon and Festival in Bethlehem every October since 2012. The Lehigh Valley is served by air transportation through Lehigh Valley International Airport ( IATA: ABE, ICAO: KABE), in the Lehigh Valley's Hanover Township, three miles (5 km) northeast of Allentown. The Lehigh Valley's inter-city bus links are to New York City, Reading, and Harrisburg, served by Klein Transportation, Fullington Trailways, Greyhound Bus, and Trans-Bridge Lines. The region has direct bus service to Philadelphia via OurBus and Clydesdale Bus Lines. Unlike similarly-sized metropolitan regions, the Lehigh Valley has very limited passenger rail service. Only Hackettstown, in far eastern Warren County, sees regular passenger railway service. Around the Valley, passenger rail only gets as close as Doylestown and Annandale, both about 30 miles away. The closest Amtrak station to Allentown is Bryn Mawr, about 41 miles to the south. The rail hubs of Philadelphia and Newark are not much further, and provide the bulk of further intercity traffic from the Lehigh Valley. Bieber and Trans-Bridge Lines provide regular bus service from all over the Valley to both Philadelphia and Newark. Passenger service to Allentown and Bethlehem ceased in 1981 when several rail operators opted to curtail long-distance services. From the south, SEPTA Regional Rail limited their services to their electrified-only territory with trains going only as far north as Lansdale and Doylestown, Pennsylvania. (In the early and mid twentieth century golden age of passenger rail, the Reading Railroad provided rail service south and west of the area.  ) To the east, the Central Railroad of New Jersey ceased passenger operations into the area, from Jersey City, New Jersey, in 1967 in conjunction with the Aldene Connection. In November 2008, the Lehigh Valley Economic Development Corporation (LVEDC), along with both Lehigh and Northampton Counties, commissioned a study to explore the merits of expanding New Jersey Transit rail to the Lehigh Valley, which would potentially include stops in Allentown, Bethlehem and Easton. The Lehigh Valley is currently the largest metropolitan area by population on the East Coast of the United States without passenger rail service of any kind. If plan succeeds, the Lehigh Line will then once again host passenger services for the first time since 1961. The fourth major highway in the Valley is Interstate 476, the Northeast Extension of the Pennsylvania Turnpike. It stretches 131 miles (211 km) from Chester in the south to the Scranton– Wilkes Barre area in the north. Tim Heidecker, actor, comedian, co-star, Tim and Eric Awesome Show, Great Job! ^ Technically, the Panther Creek Valley sandwiched between the coal bearing valleys of Broad Mountain/ Nesquehoning Creek/ Nesquehoning Ridge and Pisgah Ridge/ Mauch Chunk Creek is part of the Schuylkill River watershed. However, culturally, highway and railroad connections influenced the LC&N Co. company towns east of Tamaqua and the Little Schuylkill River are strongly tied to the historic Mauch Chunk and the Canal operations of the LC&N Company. ^ Historians split hairs with weasel words over which railroads were first, second, third, etc. and why... which criteria is more important, such as a charter date, incorporation date, completion date, or operations began date. One option is which became 'common carriers', which limits the early choices to the B&O Railroad, the SH&MC, the Delaware and Hudson Gravity Railroad, the Mohawk and Hudson Rail Road, and the shortline Granite Railroad. The B&O can claim first regular commercial common carrier runs; the SH&MC not only being earlier in actual operation, but also the first to carry passengers (1827) and then paying passengers (1829), all as a subsidiary component to the LC&N. It later began carrying common cargoes and passengers to Summit Hill, at that point a company mining camp. While all three survived into the 1930s, none of the other chartered railroads operated before 1829, only the Granite Railroad of Quincy. ^ a b c "American Fact Finder: Annual Estimates of the Resident Population". United States Census Bureau. April 1, 2010. Retrieved 2018-05-15. ^ a b c "Office of Management and Budget". Retrieved October 30, 2016. ^ "Guide to the Valley search results, filtered by Allentown". Archived from the original on July 8, 2016. Retrieved October 30, 2016. ^ "Metropolitan statistical areas and components". Retrieved December 19, 2009. ^ "U.S. Census Bureau QuickFacts: Allentown city, Pennsylvania". Census Bureau QuickFacts. ^ a b c "Lehigh Valley takes No. 2 spot on national economic development list – LVB". Retrieved October 30, 2016. ^ a b "10 best U.S. cities for your company's finance and IT operations". ^ "Downtown Allentown called a national success story by Urban Land Institute – LVB". Retrieved October 30, 2016. ^ Virtually all the LH&S trackage is managed and operated by either the Reading Blue Mountain and Northern Railroad (RBM&N) or Norfolk-Southern Railway and generated rental income for LC&N Co. until the 1960s collapse of many Eastern railways before the CONRAIL consolidation in the 1970s. ^ The Lehigh Canal, the Delaware Canal, the Delaware & Raritan Canal, the Delaware and Hudson Canal and the Morris Canal all permitted industrial transport by boat or barge with crossings of or travel along the wide placid Delaware River. The D&H system offered access to the upper Hudson, while two of the New Jersey canals joined Easton to New York Harbor. 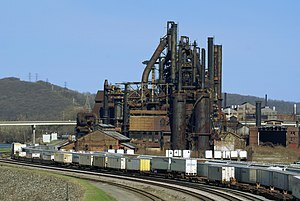 Coal fired foundries boot strapped the iron needed for railroads, and railroads accelerated movement of people, goods and raw materials. ^ American FactFinder, United States Census Bureau. "Allentown-Bethlehem-Easton, PA-NJ Metro Area – ACS Demographic and Housing Estimates: 2008". Factfinder.census.gov. Retrieved March 23, 2011. ^ Kraus, Scott (July 14, 2012). "No end in sight to Valley's population growth". The Morning Call. Allentown, Pennsylvania. Retrieved February 13, 2013. ^ a b "Lehigh County, Pennsylvania detailed profile – houses, real estate, cost of living, wages, work, agriculture, ancestries, and more". Retrieved October 30, 2016. ^ "U.S.A.! U.S.A.! Competitive costs and consumer awareness spur more manufacturers to set up shop in America — and the Greater Lehigh Valley. – LVB". Retrieved October 30, 2016. ^ Call, The Morning. "Inside Amazon's Warehouse". Retrieved October 30, 2016. ^ a b Lehigh Valley job forecast good Morning Call (2012-11-26). Retrieved on 2013-07-23. ^ "State's business climate is an attractive one". Morning Call. August 21, 2008. Retrieved March 23, 2011. ^ Assad, Matt. "Is the Lehigh Valley the next 'Inland Empire'?". themorningcall.com. Retrieved 2017-08-20. ^ a b Salamone, Matt Assad, Anthony. "Lehigh Valley FedEx Ground terminal to be company's largest in U.S., VP says". Lehigh Valley Business Cycle. Retrieved 2017-08-19. ^ "Samuel Adams beer-maker Boston Beer continues to invest in Valley". Retrieved October 30, 2016. ^ "Ocean Spray plant in Lehigh Valley has high-tech features that set it apart, officials say". ^ "Pennsylvania snuffs tobacco taxes for second straight year – Morning Call". Articles.mcall.com. December 31, 1989. Retrieved March 23, 2011. ^ Satullo, Sara K. (November 1, 2011). "Sands Casino Resort Bethlehem opens outlet mall this morning". The Express-Times. Easton, Pennsylvania. Retrieved November 4, 2011. ^ "Finishing position of Lehigh Valley ARML team each year". Retrieved August 18, 2017. ^ "Coca-Cola Park Info, IronPigs Baseball Official Website". Archived from the original on May 9, 2008. Retrieved May 5, 2008. ^ "Baseball Reference Bullpen: Scranton/Wilkes-Barre Red Barons". Retrieved May 5, 2008. ^ "Lehigh-Lafayette Rivalry Dividing Families for 144 Years". The Daily Orange. November 13, 2007. Archived from the original on October 13, 2008. Retrieved March 23, 2011. ^ "Super 25 prep football regional rankings". USA Today. December 22, 2008. Retrieved January 9, 2009. ^ Satullo, Sara (September 13, 2016). "Could train controversy tarnish Via Marathon's draw?". Lehigh Valley Live. Retrieved April 27, 2017. ^ "Halloween in Emmaus 5K Running Event – The Parade Before the Parade". emmaus5k.com. ^ "Rollercoaster Database: Steel Force (Dorney Park & Wildwater Kingdom)". Retrieved July 10, 2008. ^ News, 69 (2018-05-27). "Allentown Fairgrounds holds Music and Arts Celebration". WFMZ. Retrieved 2019-02-12. ^ Call, The Morning. "Allentown ArtsFest brings alternative entertainment and fun for the fifth year". themorningcall.com. Retrieved 2019-02-12. ^ "Cargo traffic soars, as more passengers choose LVIA, too". lehighvalleylive.com. Retrieved 2017-08-19. ^ "LVIA adds $5.2M transportation hub for buses, taxis and rental cars | LVB". Lehigh Valley Business. Retrieved 2017-08-19. ^ Assad, Matt. "Amazon has LVIA flying high". Lehigh Valley Business Cycle. Retrieved 2017-08-19. ^ Kraus, Scott. "LVIA air traffic jumped in 2016, due mostly to cargo". Lehigh Valley Business Cycle. Retrieved 2017-08-19. ^ "Queen City Airport Designated General Aviation Airport of the Year by the Federal Administration Eastern Region". Lehigh Valley International Airport. Archived from the original on June 12, 2007. Retrieved June 22, 2007. ^ "Railroad ties: A Reading Railroad timeline". Readingeagle.com. Retrieved March 23, 2011. ^ "Philadelphia, Pennsylvania (PA) and the history of the railroads in the Delaware River Valley". Membrane.com. Retrieved March 23, 2011. ^ "How Well Does Amtrak Serve U.S. Cities?". Trainweb.org. Retrieved March 23, 2011. ^ Lauer-Williams, Kathy (2008). "Lehigh Valley wineries earn recognition". Pittsburgh Post-Gazette. April 17, 2008.